Nebbiolo is the champ of all middleweight grapes in Italy! This is a bold statement and I bet the Brunello producers in Tuscany would disagree. But put them against each other in a death match and there is no doubt that a Barolo would outlast, out muscle and be ready to take on another grape at the end of the blood bath. 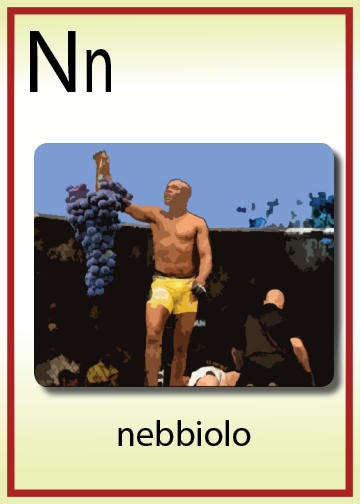 A great analogy would be like putting Anderson Silva, the UFC middleweight title holder (Nebbiolo) and Michael Bisbing (Sangiovese) in the Octagon. Sangiovese’s mouth would stop running when Nebbiolo’s technique and experience outclassed his opponent. Nebbiolo’s home is Piedmont, one of the larger wine growing regions of Italy. It is located in the Northwestern part of Italy. If you were putting on the boot (map of Italy), Piedmont is located right around where you would tie the bow to your laces. Nebbiolo’s most admired wines are those of Barolo and Barbaresco. The greatest influence in this region are the wines of Burgundy. They are made with, only one variety and made to last. The greatest misconception of Nebbiolo is that it is a big, full-bodied wine. The only thing big about Nebbiolo is its tannins. Other than that it is light in color and expresses more herbal and earth notes than fruit. Like Anderson Silva, you would think that to be the champ in the 185lb division, you would have to be muscular, strong and somewhat of a bruiser. But Anderson is wiry, quick and smart. What makes Nebbiolo the champ? His wines are elegant yet they have structure due to the tannic backbone. The aromas are of potpourri and herbs such as fennel and star anise. The flavors are of leather and tobacco. The wines come across as dark but they are not BIG! These are wines of intensity without the alcohol, and are long lasting. These are the characteristics of a true Champ! There will always be someone else to come by and take his title, but for now Nebbiolo will rule the red grape division of Italy.